Camp Kuzuma is a private and exclusive safari lodge situated in the pristine Kazuma Forest reserve. This bush lodge is well appointed in the elephant abundant Chobe region of Botswana. Overlooking a waterhole frequented by herds of African elephant and surrounded by the open plains of the Kazuma Pans, the camp offers a truly unique safari experience. At Camp Kuzuma guests have the opportunity to encounter elephants in their natural habitat from the comfort of a five star lodge. Besides incredible elephant encounters, one can expect to see wildebeest, buffalo, roan antelope, the very beautiful and rare sable, giraffe, lion and leopard during your luxury holiday at Camp Kuzuma. All of which are commonly seen in the area. Camp Kuzuma is fortunate enough to be located in a country that is home to Africa’s largest free roaming elephant herds. In 2014 an estimate of 200,000 elephants roamed Botswana. These massive breeding herds of elephants are known to move thousands of kilometres across the country’s wild lands, using ancient routes and elephant corridors through private farms, national parks, towns and deep into neighbouring countries too. Camp Kuzuma, which borders the Chobe National Park in the North of Botswana, is one of these private game reserves that offer safe passage to elephants. The lodge is situated in the busiest elephant corridor that joins two of the world’s greatest parks: The Chobe National Park in Botswana and the Hwange National Park in Zimbabwe. With over 20 000 hectares of private traversing concession, Camp Kuzuma’s wilderness lodge offers an incredible and unforgettable African Elephant experience. Accessible by air via Kasane Airport, Victoria Falls or Livingstone Airports or by road from Kasane the lodge is ideally positioned to fit into most safari itineraries. a sundeck and is spacious inside, measuring over 520sq ft, with super king size beds and overhead fans. A nostalgic ambience prevails with safari memorabilia and furnishings reminiscent of the days of legendary explorer David Livingstone, as well as en suite canvas bathrooms with high-back Victorian baths, double basins, double internal showers as well as cool, refreshing outdoor showers. The main lodge area is home to an open plan bar, lounge and dining area which serves sumptuous African cuisine. The main area extends onto a large wooden deck with a sparkling swimming pool that overlooks a floodlit waterhole that is frequently visited by an abundance of wildlife including herds of elephant and lion prides. The perfect setting for a luxury bush holiday. The nearby sunken fire pit just off the deck welcomes guests and offers an opportunity to find solace and comfort whilst reading a book in the cool afternoon breeze, or whilst enjoying a fine dining experience under the African stars. Evenings for your luxury holiday are rounded off with a night cap around the open fire where guests share their sightings and recap their stories of the day. The nearby sunken boma just off the deck welcomes guests and offers an opportunity to find solace and comfort whilst reading a book in the cool afternoon breeze, or whilst enjoying a unique dining experience under the African stars. Evenings are rounded off with a night cap around the open fire where guests share their sightings and recap their stories of the day. The abundance of wildlife roaming the private forestry area of the Kazuma Plains is a sight to behold. Herds roam the open plains: wildebeest, elephant, buffalo, roan antelope, sable, giraffe, lion and leopard are commonly seen in the area. Use the camp as a base to explore the surrounding areas such as the famous Chobe National Park, embark on a cruise on the Chobe River or visit the natural wonder of the Victoria Falls. 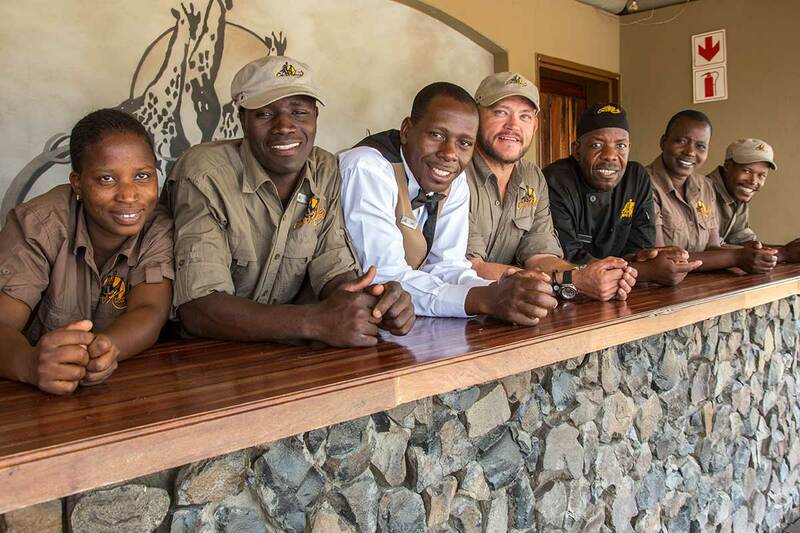 When dining at Camp Kuzuma you’ll be treated to an array of gourmet safari cuisine with a African flair, all prepared by our passionate Five Star chefs ensuring that your dining experiences with us are perfectly suited to satisfy your individual tastes. Fine dining gourmet meals with the freshest ingredients and flavoured with aromatic spices give you a taste of Africa, served in our simple but elegant dining room, open to the warm breezes coming off the wilderness or on our deck beneath a myriad of stars looking out onto the Kuzuma Plains. Romantic dining is epitomised by a private dinner set next to the pool overlooking the watering hole under a star-studded African night sky, enjoying the flavour of gourmet meals. The experience adds enchantment to any African luxury holiday. Satisfy your appetite after the game drive with our scrumptious brunch. The morning game drive sets out at first light and while you’re out our chefs are happily preparing your brunch feast. Served in the main restaurant or on the deck next to the pool, weather permitting, around 9:30, you’ll get to enjoy a full range of seasonal fruits, yogurts, nuts, and muffins or freshly baked bread. Refresh with fruit juices, French Press coffee or be adventurous and mix it up with some bubbly! This all complimented by a hot-cooked breakfast of the day. At Camp Kuzuma we offer our guests the complete African experience with a wide range of activities to choose from. We offer activities onsite at Camp Kuzuma and also offsite luxury African safaris in the surrounding areas to explore Africa. The offsite activities on offer are dependent on visas. Camp Kuzuma’s game drive is a luxurious safari experience. Game drives are the ideal occasion to spot the wild animals of Botswana, but with Camp Kuzuma it is so much more. During game drives guests are treated to drinks and snacks whilst on the lookout for Botswana’s beautiful wildlife. A spectacular diversity of wildlife moves through this immense wilderness, including breeding herds of elephant, leopard, lion, spotted hyena, giraffe, large buffalo herds, roan antelope and sable to name a few. The game drives are conducted in the early morning and late afternoon, as wildlife is more active during the cooler hours of the day. All game drives are included in your stay and are conducted at 7:00 and 18:30. There is no better way to learn more about nature than to be in it and experience it firsthand. Soak in the African scenery and enjoy the sunny climate. Hiking trails are available for guests to experience wildlife on foot and get closer to nature. A walking tour through the bush with an experienced guide offers guests the opportunity to experience the wilderness from a new and exciting perspective. These guided walks also allow for guests to explore Botswana up close, instead of just doing the regular game drive. These bush walks are accompanied by qualified camp guides who make sure that the hiking trails are safe and informative. Botswana is known to have the highest elephant population in Africa and Camp Kuzuma’s luxury lodge brings you up close with these amazing animals. Our lodge is based in one of the busiest elephant corridors, which means that while lounging on your private sun deck or relaxing at the pool or spa, you get the perfect tour of the African elephant as it grazes by, giving you a true African experience. The Chobe River, situated not too far from Camp Kuzuma, supports up to 50 000 elephants in the dry season when the water in the hinterland has dried up. Botswana also has a very active and effective non-profit group, Elephants Without Borders, who works hard at supporting the sustainability of the elephant, as well as other wildlife in this area. So, for any person eager to have an up close safari experience with elephants Camp Kuzuma is the ideal spot to be. The Kazuma Plains are renowned for their prolific birdlife, making Camp Kuzuma perfect for bird watching in Africa. For enthusiasts, some 380 different African bird species are found in this region. To give you a better insight into the birdlife in Botswana The BirdLife Botswana Committee was established as a formal science and research based organisation. A sub-committee of BirdLife Botswana is dedicated to keep records of rare and uncommon bird species in Botswana. For more information on the bird watching season in Botswana and tips for bird watching, visit Birding Botswana. Exploring the beautiful birds surrounding Camp Kuzuma is just another reason why this is one of the top travel destinations. Nature never sleeps. Elephants are believed to only sleep about four hours. So even at night time one can expect to come across these majestic animals. Exciting night drives before dinner offers the perfect tour for guests to encounter nocturnal animals as well as the possibility of observing nocturnal predators such as lion, leopard and hyena who hunt after sunset. Camp Kuzuma’s Bush Spa is a natural haven of serenity offering a wide variety of treatments to soothe the soul. The luxury outdoor spa facility, situated close to the main lodge, has been created to compliment the beauty and tranquillity of the wilderness. Spa goers can take in the magical views of wildlife playing in the watering hole whilst receiving a luxurious spa treatment. Kuzuma’s breathtaking outdoor spa offers massages, reflexology, aromatherapy, facials and hand and foot treatments. Whether it is a simple post-drive pedicure or a full body massage, a spa break at our sanctuary will leave guests feeling refreshed and rejuvenated.